We all have a practice swing that is sheer poetry, but put a golf ball in front of us and we become our old selves again. How do we stop doing that? First of all, why do we do it? It’s because we get too caught up in results instead of process. If we do the right things, and the ball is in the way, it will go where we want it to go. We just can’t resist adding a little extra, trying to make the ball go where we want it to, just to be sure. We can’t believe it is as simple as just swinging the club correctly. 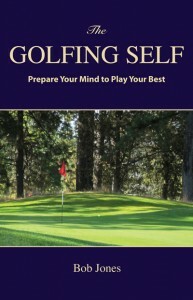 So here’s my advice on how to re-train your brain not to get distracted by the ball — how to see your swing at a ball in the same way as you take your practice swing. Put a ball on the ground in front of you, and address it. Now back away from it about six inches so when you swing you won’t hit it. Make some swings, five or so, heck, ten, but as you swing, look at the ball. Don’t ignore it as you do with a practice swing. Look at that ball head on. After a time, your mind will start associating the ball in front of you with a smooth swing that does not contact the ball in funny ways. Funny peculiar, not funny ha ha. Because there is no result with this swing, your mind stops thinking about results, and focuses just on swinging. Your conscious mind is in on the deception, but your unconscious mind is not at all this subtle. All it knows is that when you swing at the ball, nothing happens. There’s nothing to worry about. Your fears never arise, and it’s from the unconscious mind where they originate. Since you’re re-training your brain, you have to practice this exercise a lot. You can’t just give yourself a suggestion. That’s working with your conscious mind. Habits are formed in the unconscious mind. Doing this drill over and over is how you build a new habit, one that leaves you feeling like hitting the ball is doesn’t add anything to what you’re already doing. That’s how you keep the ball from distracting you. One of the keys to hitting a straight shot is for the angle in your left wrist be the same at the top of the backswing as it is at address. This video shows you why that is so, and how to learn this critical skill. Here’s the rule. If you have less bend in the left wrist at the top than at address, you have closed the clubface. If you have more bend at the top than at address, you have opened the clubface. The best way to fix a mismatch is to set the club at the top the way you like it. If you like a cuppy wrist up there, you need a strong grip. If you like a flat left wrist at the top, a neutral grip will do. A bowed out left wrist is seldom seen in recreational golf, but if that’s you, use a weak grip. In 1971, Alan Shepard hit a specially prepared 6-iron while on the moon. If you want to know what a golf course in the moon would look like, I give you Chambers Bay, site of this week’s U.S. Open. Amidst sandy areas, dunes, and steep hills, you can actually find fairways, greens, and trees (well, just one tree). 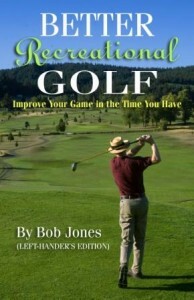 Getting the ball around the course is not straightforward. The fairways, which instead of being shaped like elongated sausages, look more like ruptured appendixes, offer several lines of play depending how much of the fairway you want to bite into. As for the greens, they are not the slightest bit simple. If the USGA miscalculates, a pin position could be anywhere from embarrassing to impossible. 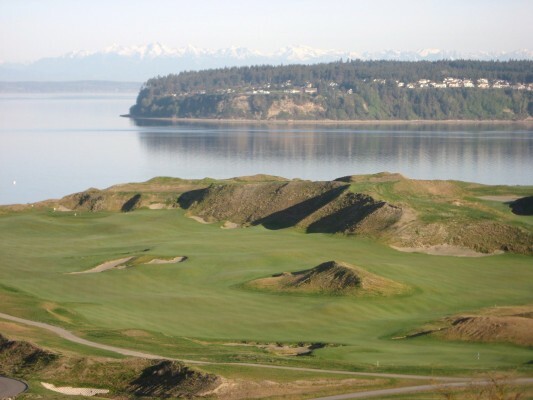 This photo shows the 1st and 18th fairways, with Puget Sound, Fox Island, and the Olympic Peninsula in the background. Par will be 70, but it breaks down as 35-35 or 36-34 depending on whether the 1st and 18th are par 4s or par 5s (they will swap each day). Total yardage can vary between 7,200 to 7,600 yards. Though it might not be apparent on television, there is an overall elevation difference from the highest and lowest spots on the course of over 300 feet. Even though it is the Pacific Northwest, and Puget Sound, along which the course lies, is essentially an inland sea, there isn’t much rain or wind in June. Trains run by the course affecting play on the entire 16th and 17th holes, and the tee shot in 18. These are not little commuter rains, but full-sized freight trains. 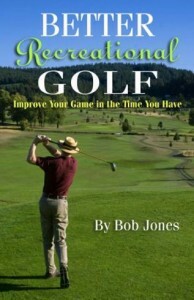 Do not expect golfers to be allowed to wait the three or four minutes it takes for them to go by before hitting a shot. In case you’ve ever wondered how hard a U.S. Open course is, the course rating this week is 77.3, and the slope rating is 145. That means if you shot 90, you could turn in a handicap differential of 9.9. Par is a +5.7 differential. But actually, I think it’s much harder than that. 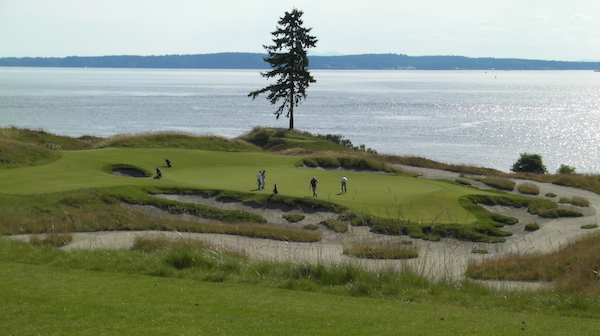 The course is too new to have the key holes identified, but the most picturesque one is the 15th, a par 3 that runs toward the Sound and has the course’s only tree perched behind the green. Here’s a detailed look at the course, hole by hole, from a caddy at the course. Study his comments well to get the most out of watching the tournament. There are some odd rule quirks that you, and especially Dustin Johnson, should pay attention to. Greens and fairways are made of the same grass, fine fescue, and cut to virtually the same height. It can be difficult to know if your ball is on the green or not. At the 2010 U.S. Amateur, played here, the USGA put small white dots around the green to mark its limits. They haven’t decided if they will do that for the Open. When in doubt, call a rules official, though how he or she will know is a good question. Sandy areas that are raked are hazards, while sandy areas that are not raked and contain vegetation are through the green. Sometimes both can be found in the same larger patch of sand. Again, call a rules official if in doubt. Finally, players will be permitted to move stones that are in a bunker, according to a local rule the USGA will put in effect for the tournament. So who do I pick to win? The player with the best control of his irons will be hard to beat. That can be anyone who gets hot for four days. I will say this: the winning score will be over par, which means a player who is content to take what the course gives him will have a big advantage.